By F. W. Elliott Ltd. of Croydon. Stores reference 21B/792. Type 1 'Operations Room' clock with a 14" silk screen printed dial with and a solid mahogany 18" diameter case. Eight day Elliott single fusee movement (serial number 17414 ) with 1941 date. The dial is in super original condition. Totally unrestored, this shows very little paint loss other than small areas in the usual places - where the lower left dial post is attached, the surround of the key winding hole and dial screw holes. The RAF crest remains in very good condition and the coloured sectors retain strong colour. The case has a few minor bumps/scratches but is in good overall condition. One of the original dowel pegs is absent but these are not difficult to obtain. The back box is stamped with Elliott and Air Ministry marks. The lower access door lock is absent. At some point a simple wooden swivel 'lock' has been added to keep it closed. The side access door lacks the small metal 'clasp' that holds it closed but this would be easy to replace. All parts of the wooden case had a matching number stamped into them - these have been filed/ground out at some point but these are not seen externally at all. The original cast brass bezel is excellent with a quality hinge consumate with the period of the clock. It is unclear as to whether the bezel was originally blackened but it now has a lovely matt patina. The movement was very lightly cleaned andlubricated before we purchased the clock (note lightly cleaned, not stripped, cleaned and polished) and is running well and keeping good time. The pendulum appears to be original bar the suspension 'feather'. All in all this is a lovely unmolested clock. We prefer clocks with totally original dials even if this means some rust and paint loss and believe these to be of far more historical value than repainted or refinished examples. That said, the very minor paint loss on the dial could be sensitively improved with careful restoration but we will leave this for the buyer to decide. 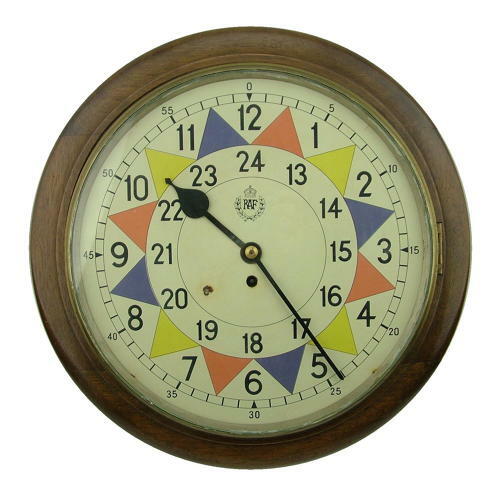 A rare opportunity to own one of the classic clocks as used in the WW2 Operations rooms of RAF stations. A very good working display item. This is a large and heavy item. We would prefer the buyer to collect but will post worldwide. Please note whislt we will pack this item with extreme care most courier companies will not insure clocks in transit. More photos are available now on request. Stock code C22178.